Sunderland have plenty of fight in them, which is just as well because they seem to be battling against themselves at times. Under Gustavo Poyet, the Black Cats have mastered the art of making their supporters, in his words, “come away with a happy face”. His substitutions have often been a big factor. However, as yet, they have still not managed to do enough. Twice Sunderland have got into a position where victory would take them out of the relegation zone. In Cardiff, and on Saturday at home to Southampton, they responded with arguably their two worst halves of football under the Uruguayan. It is not the only mental hurdle these players are yet to overcome. They seem to have a problem playing Premier League matches at the Stadium of Light. They have found their feet away since Christmas and England’s only 100% cup record has been built entirely on Wearside. Recent home league form is respectable for a team level on points at the bottom of the table, but no more. The cup games have come either against Football League teams or as underdogs. They are finding it difficult to set the tone on their own turf. Defender Jonh O’Shea said of Saturday: “In the first half we played like a team of strangers. The first half-hour was like a training exercise to build up a team’s confidence. It was as if Sunderland had been told to play non-contact football and stand off the man in possession. When they got the ball, one in every three passes went astray. Lee Cattermole was yellow-carded for a cynical and unneccessary tackle after giving the ball away himself. Jay Rodriguez was in his own half. Jozy Altidore challenged for a ball which flew up in the air. He spun around 360 degrees looking in vain for it like a dog chasing its tail. Between them Phil Bardsley, stood on the touchline, and Adam Johnson, three yards away, did not realise the former was offside and therefore not a good person to pass to. Jose Fonte put Fabio Borini on his backside just by changing direction. Even Vito Mannone was at it, clearing from the right-hand edge of his penalty area straight to Jack Cork, just in front of the centre circle. The midfielder missed the open goal. It was bewildering at half-time that Southampton were only a goal up. In the fourth minute Jay Rodriguez had taken advantage of Marcus Alonso’s hashed clearance and the absence of any pressing to put his side in front after teeing himself up. Morgan Schneiderlin played in Rickie Lambert after the striker’s neat step-over, only for the shot to hit the post. When Lambert robbed Wes Brown, Rodriguez steered his shot at Mannone. The goalkeeper had already frustrated Luke Shaw, reacting quickly when his shot threatened to creep inside the near post after deflecting off Johnson. Sunderland’s fans were unable to keep in their frustration. It would be wrong to criticise supporters who have endured sub-standard football for far too long, but their impatience is not helping the Black Cats feel happy at home. They booed the players off at half-time – and why not? They had been dreadful. When Altidore was unable to get the ball out of his feet to play in Sebastian Larsson three minutes after the interval the fans were on his back. Not that they would have had much faith the Swede would score. Larsson got it worse than anyone. He seems to be a favourite of Poyet’s, mystifyingly the latest manager to persist with the Swede in central midfield, presumably as a set-piece expert. Without a goal of his own in this season’s Premier League, his last assist came from a corner at Southampton in August. He is also keeping out a terrace favourite Jack Colback, whose name was sung ever more loudly until he came on after 63 minutes. Larsson’s withdrawal was cheered heartily, though not as vigorously as Colback’s introduction. The other half of the double substitution, Craig Gardner coming on for Cattermole, was most telling. That Poyet had something to work with was thanks to Borini and the on-form Johnson. When Peter Lovren volleyed in Lallana’s 31st-minute corner, it looked like Southampton could win by as many as they wanted. Seconds later, Johnson played the ball in for Borini to chest and scuff beyond Artur Boruc. The Italian may not get many goals but they are always important. With no half-time substitutions, there was no instant sign things would change. Phil Bardsley shot wide from Larsson’s quick-thinking free-kick but Mannone was the busy goalkeeper, stretching to keep out Calum Chambers’ low shot, denying Rodriguez after a nutmeg on Cattermole, keeping out Fonte’s header and watching Lallana’s shot hit the side-netting. However, when Borini had a goal correctly ruled offside after 65 minutes, something clicked. Boruc could only touch Johnson’s powerful shot in off his post. There is no stopping the winger in 2014, as five goals and four assists prove. The Pole quickly made amends, denying Gardner, Fletcher, from spitting distance, then Johnson. Sunderland were fortunate Chris Foy read more into Brown getting a foot on the ball than the damage his tackle did following through on Gaston Ramires, the first of two Southampton players stretchered off after a passage of play in which neither was awarded fouls. 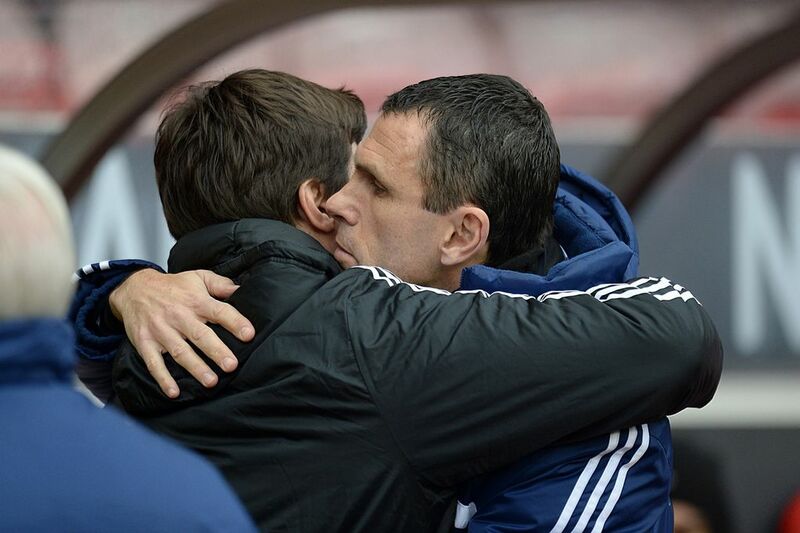 It was the Saints praying for full-time, but Sunderland’s was only a qualified success.